September 24, 2011 September 24, 2011 Dan O. At least we now know where Fantasy Leagues came from. This is about the true story Billy Beane, a former jock turned general manager who uses unconventional methods to bring the best players to the Oakland A’s, a major league baseball team struggling against financial hardship. I watch baseball from time to time and being from Philadelphia, I have been apart of a couple of heart-breaks before, but I’m sure as hell glad we weren’t this bad. But I do wish Charlie Manual looked like Brad. Director Bennett Miller takes the average and cliched sports movies, and turns it into something that actually does something not many have been able to do: makes whatever sport their talking about, entertaining to watch for those who don’t know anything about it. Miller has many moments of inspired direction with just focusing on how the team is built up with lots and lots of talking, with barely any of the actual game of baseball being played. I mean you of course get the usual sports montages and inspirational moments, but the film is more about the numbers and how to run a successful baseball team with such a slight budget. You also get the feeling that Billy Beane and his team actually changed the way we look at players and baseball, but they don’t try to hit you over the head with that point too much which I was very glad for. The talking in this film is what also kept me entertained because I never actually knew just how Beane’s way of team-building changed the way we look at sports nowadays. Steven Zaillian and Aaron Sorkin both wrote this script and you can tell that they had a lot of fun with this because there are some great moments of hilarity but also plenty of insight and human emotion into these character’s lives that we actually do start to care for. Sorkin brings that constant hammering of words back-and-forth in the script and works here the most, especially when the film is just flying numbers that we have no idea about, right at us. My problem with this film is that as much as the emotional aspect for this film may have worked, at the same time it kind of took away from the film too. The film shows Billy Beane and how he deals with all of this failure with his baseball team as well as his failure to live up to his expectations as an actual baseball player. This part of the story worked but the film didn’t focus on just that, they also brought in his daughter that really is in the film for about 3 scenes but the film tries so hard to make it seem like she has such an impact on the story that it really seems forced. They try to make Billy’s family “issues” (if there are any) more important than the actual team itself and even that song his daughter writes for him seems something that no 12-year old ever would write. I’m talking about you too Justin Beiber! The film also tends to run on too long which sometimes isn’t as much of a problem if the film keeps you going, but the pace itself keeps stopping and going to the point of when I didn’t know when it was going to end, nor did I have a feeling they were going to choose a good ending. It’s about a 2 hour and 12 minute movie, which for some is way too long and especially too long for the people around me as everybody I looked at seemed to be moving around a lot after about the 2 hour mark. I came to see this film for one reason and one main reason only and that was Brad Pitt, who plays A’s manager, Billy Beane. This is a great performance from Pitt as usual because he really gets to challenge the depth of his acting skills with this character. It’s so easy to sympathize with this guy because he seems like such a nice and cool dude who’s caught in a total rutt and wants nothing more to actually win some games and keep this franchise alive. Just by looking at his face, I already felt the emotions that he was feeling and that’s what Pitt does best here. He also gets to show a lot of that great charm that he always has in any film and whether he’s just talking to player, spouting out numbers, or walking around always so cool like he always does, Pitt just shows that he can hit every chord with the audience that needs to be hit with one character. 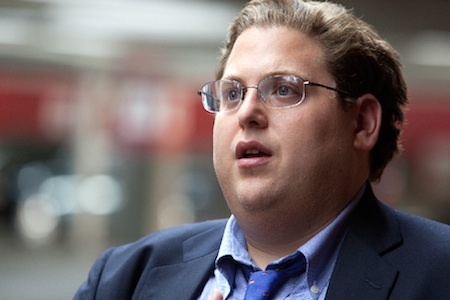 Jonah Hill is also great in this very tied-down role as Peter Brand, our numbers man. Hill (who was fat still) brings a lot of funny moments to the film and actually makes you believe him as this total number-nerd that builds this great friendship with Beane. Hill and Pitt are probably the most unlikely buddies in any film, but they make it work every chance they get and their scenes just really had me involved almost every time. It’s cool that two totally different actors like Hill and Pitt can actually come together for one film and make it seem believable, rather than just something that Hollywood executives needed for money. Philip Seymour Hoffman gets the top-billing for this film as well but he’s rarely in this but plays the best to his advantage as Art Howe, Beane’s biggest problem when it comes to staff. Consensus: Moneyball doesn’t fully hit it out of the park (cliche, I know) but does however give us a great look at a system in baseball that changed the game forever, as well as being well-acted, funny, and still touching somewhere in between all the numbers. I’d see it again! You bring up some great points about the amount of emotion and the few scenes involving Beane’s daughter. The book goes into much more detail about his family and Billy’s own player experiences. But Hollywood will take its liberties. It’s very good though and even though his family problems didn’t really have me concerned, I still enjoyed a lot of this. Thanks Mia! Man, so funny. I ended my review with like a similar last line. Its almost like you cant help it. I think, on this one, we see eye to eye completely. Pitt is DEFINITELY the main reason to see this, he was fantastic. And the emotional component does feel a little shoehorned in. Plus as a Baseball fan 1) I knew how it ended and 2) I noticed a lot of the Hollywood BS that wasnt really true. But yeah, it was excellent. Very very easy movie to recommend! Very very easy and a very fun and entertaining watch that actually has a great deal of story to it that we actually care about. Thanks Dan! Good review-there are some inconsistencies about the movie that keep it from being truly great. True, but it is still a great watch none the less. Thanks! Hi – your review touched on some points that I either overlooked while watching the film or I pointedly ddin’t mention in my own review. Yes, there were some slow spots – in fact when you have Aaron Sorkin and Steve Zaillian writing it seems lik some of the montages involving the contemplative Beane weren’t necessary and simply added to the films length. For example when Beane is cruising in the pickup truck heading for Visalia – didn’t it seemed like he almost changed direction and turned back two times before actually exiting the highway finally (the 3rd time). I also thought the daughter had three scenes and the ex-wife, played by Robin Wright has only one scene. Why hire Robin then give her so little screen time? And yes – I am a big basebal fan – so I knew the outcome of the 2002 season. And this knowledge does take away from the possibility (for me) of a rousing finish to the film. But guess what, thats why it does come back to Brad Pitt as the reason the film succeeds. You might say that while the film may not be homerun of a movie – but there’s no denying that Pitt’s performance was a monster homerun. Thanks for your insights and review. This film works very well and I’m glad that it did but there were some parts here that worked, and others that just didn’t. Thanks Jmm! Sports movies don’t really get a lot of awards attention, to say so, that’s why I am curious about this one, Brad Pitt must be amazing in it! I will check it out!Thanks for the review! He’s awesome and this film is very very good. Thanks Diana! Hope you like it! I didn’t know Hoffman was in it. Makes me want to see it more. But I’m with you in that the main reason I want to see this is because Pitt’s performance looks really interesting. Pitt is great and isn’t the sole reason the film works, but a big reason none the less. Thanks! hmmmm…like many reviews I’ve read of this film, yours doesn’t make me exactly want to see it either. it looks like exactly what the trailer implies–a good cast mixed up in the underbelly of a merely decent movie that strikes a vague emotional chord. i will rent this. It’s good, I have to say, just something that could have been so much better really. But still, check it out Candice! I’ll be seeing this soon. I’m a sports stats nerd, so I’m looking forward to it. Haha good for you my man! Hope you like it! I saw it. And I loved it! I’m looking forward to this one. Skilled writers and actors, how could it go wrong? I don’t know how it could!?! And the best thing is that it doesn’t! I’m glad! Hope you like it! Great review. I agree with your insights, especially about the actors. Who’d think, Pitt and Hill together on screen?! I personally didn’t think it was too long. Luckily no squirming in the audience I was a member of, in fact, they cheered at the end. Looking forward to reading more of your reviews! *They cheered for the story (this WAS in Oakland), not for the film finally ending, haha. My fans cheered at the end too, but the problem was that too many people were checking their washes and getting a little annoyed. Thanks! Thanks Michael! I hope you like it! Seriously looking forward to this. Excited every time I hear another film with Pitt in it comes out. Great review! Thanks Vik! Check it out if you really do love him, because you won’t be disappointed by him here. We have to wait a really long time for this to appear in the UK but when it does I’ll be checking it out. I’m a big fan of sports movies especially baseball and it’ll be interesting seeing a story based around the Oakland Athletics moneyball theory. You never ever hear of this story anymore so that’s why it’s really cool to finally hear and see it on the big-screen, especially with Brad Pitt and Jonah Hill. Check it out when you can Dan! Great review, Dan! I keep thinking I will have to see this again. It’s one of those movies that I thought was solid but I don’t see what all the real fuss is about. I’m usually right in those scenarios, as far as my own personal appreciation of the film goes, but I will definitely give it another go some time. And I agree with you fully that the more human elements in this film feel out of place. Why was Robin Wright even sign on for this? She was barely in it. She was barely even in this and so was the daughter but they try to make it seem like she’s such a big part of the story, but she’s barely in it really. Thanks Joseph! Give it some time though my man! good review, beautiful website. Yes, I wrote that too Brad Pitt as an A-lister did himself a lot of good with this film. He might get two nods this year and win at least one for best actor. At times he did remind me of Robert Redford though. That’s a good thing because I hated his Lions for Lambs but he is my fav actor. I thought it was a great movie. Pitt and Hill were a great combo. It’s a great insider look for those unfamiliar with baseball. I like that it switches things up and shows you the business side of things, while still making it interesting. I did think that Sorkin’s talent was undercut by the slow pacing and excessive length. They could easily have trimmed off some of the lingering glances between characters and chopped the ending a bit too, to make things tighter. People around me were also getting shifty for like the last half hour. Don’t know if you came across it, but I also did an interview with Jonah Hill for the film which you can find on my blog Reelrecon. I just saw this and wasn’t really blown away or anything. It was perfectly competent on all aspects but it kind of left me wanting for more. It’s probably a movie I would need to see a second time down the road. You make it sound really great and I like that you liked it but I still feel this was really hollow and could have explored so much of the story better…and in less than 133 minutes that’s for sure. It was good, not great and pretty much the entire cast was dispensable as nothing in the performance sold the roles. Eh maybe like Castor I missed something but I suspect it might have been painted thin to appeal to those who might not be ball fans or know the story of Beane so in that aspect it was self-defeating. Glad you liked it. Fun review! Hello, thanks for checking our my review of the film. I feel you pretty much captured what the film is like. I especially agree with your take on the film’s length and pacing (which I failed to note in my review). I’ll be following your reviews now! I don’t think I liked it nearly as much as you did. Perhaps if I’d been more of a baseball fan…. Excellent review my friend! I also enjoyed the screenplay but I couldn’t beieve it was Sorkin that contributed. This is his least-Sorkin script to me, if that is possible!